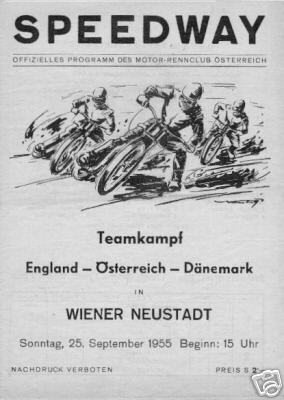 Although the Graz track was c.600 metres long, the meeting was run as speedway, NOT longtrack. Split Waterman 12 6 ? Josef Kamper 12 12 ? Kiehn Berthelsen 9 8 ? + Meeting reserves were Austrians Hans and Erich Sidlo. One of them joined Denmark's Berthelsen in heat 11 as replacements for Bech and Pander, but Sidlo's point APPEARS to have been credited to the Austrian team! + Australian Jack Biggs was listed in the "England" team, but was replaced by Welshman Williams. OTHER MATCH The touring teams also took part in a Best Pairs event at Vienna Sat 01.10. Finland 29 Austria League Select I 25 Austria League Select II 18 Heat 1: Haider, Olin, Zimmermann, Santala. Heat 2: Grubmüller, Fischbacher, Uandl, Bernsteiner. Heat 3: I.Teromaa, haider, Zimmermann, P.Teromaa. Heat 4: Olin, Santala, Sattler, Schippl. Heat 5: I.Teromaa, Fischbacher, Grubmüller, P.Teromaa. Heat 6: Haider, Zandl, Bernsteiner, Zimmermann. 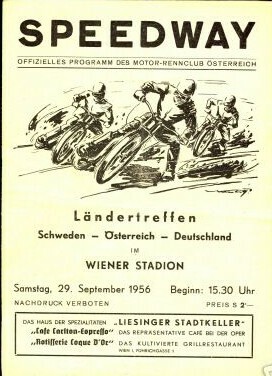 Heat 8: Olin, Fischbacher, Santala, Grubmüller. Heat 9: Haider, Schippl, Sattler, Zimmermann. 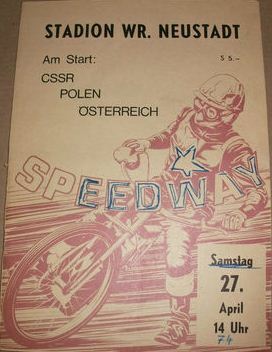 Heat 10: Olin, Zandl, Santala, Bernsteiner.